New. B-format paperback. 282 p. Picador Classic . New. 2018. Main Market. Paperback......We ship daily from our Bookshop. Fine. B-format paperback. 282 p. Picador Classic . In Stock. 100% Money Back Guarantee. Brand New, Perfect Condition, allow 4-14 business days for standard shipping. To Alaska, Hawaii, U.S. protectorate, P.O. box, and APO/FPO addresses allow 4-28 business days for Standard shipping. No expedited shipping. All orders placed with expedited shipping will be cancelled. Over 3, 000, 000 happy customers. I've seen the film which is excellent. But the book is another world - a non-romantic insight into Alexander Supertramp, with links to other wild ventures by people with a similar spirit - man trying to cohabit nature. Will read more by Krakauer. I discovered Krakauer and Junger at the same time and their work appeals to me. "So, there's this guy, and he decides to prance out into the uncivilised Alaskan bush, without even a compass. This is after doing away with $25,000, by the way. And, oh yeah, after a few months, we find him dead." Now, could this man's life story possibly be given any dignity, told without any implications of insanity? Well, it would appear Jon Krakauer has managed to do just that. While Christopher Johnson McCandless (or Alexander Supertramp--ahem, let "changed his name to sever ties with his family and earlier life" be added to his list of accomplishments) would likely be regarded by most as another of the cocky young men for whom hubris beckoned death, Into the Wild was a study into his mind, uncovering what complex motives drove him to take his fatal journey into the tundra. And no, delusions of invincibility were not included in these. Coherent within a world where adolescents all too often play the daredevil, what with their propensity for tackle sports, heroin, and anarchism, it is all too easy to dismiss McCandless as another distressed youth lacking responsibility (not to mention rationality). But exactly what Krakauer did was to humanize this outdoorsy-magazine feature story, causing it to become more than a figure at which to poke fun. Reflecting the often deeply buried journeyman inside us all, this novel spun the tale of McCandless's life prior to his adventures; a life of academic excellence, parental skirmishes, bonding with pets; a life we can all too often relate to. 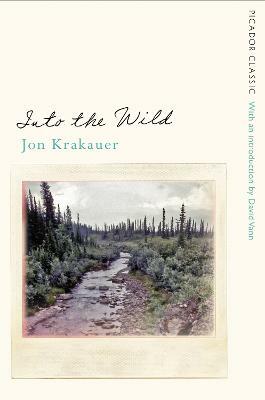 Through this lens, we begin to understand Krakauer's argument: that while most men, us included, share wild, fantastical ideals as McCandless's (or should I say Supertramp's), few have the guts to live them out; that he wasn't juvenile; he was noble. Am I beginning to sound redundant? Yeah, that is one thing. With only one real point being proven throughout these 203 pages, Krakauer's message may as well be burned into the reader's forebrain not even mid-way into the book. Because, truth be told, as fascinating as this one point is, I'm not sure any of us need to have it driven in a handful of times every chapter. I mean, sure, there are so many cases that work marvellously as evidence, but by the end what with all the repetition throughout, the book feels a tad dissatisfying, owing mainly to the fact that the reader doesn't feel like they've gotten anything out of it, not when all the "fresh" substance sort of begins its decline after the fourth chapter. And it's not only due to a lack of variety in material that this insubstantial feeling arises from Into the Wild. For a theme suggested to be as universally applicable as this, surfacing from the covers will not bring more than a whim of inspiration. Sure, the novel was argumentative, and sure, it drew on our emotions, causing us to relate, but unfortunately Krakauer seems to have decided not to take his work just one step further, not including any passages that might cause us to alter our perspectives on life. We might understand what Krakauer's trying to say, but we're not pushed to agree. Simply put, we're given the ability to peer into McCandless/Supertramp's most intimate thoughts, but it still feels...distant, irrelevant. Though at least we can peer into those most intimate thoughts. And this is where Krakauer excels. In examining not only McCandless/Supertramp's Alaskan odyssey, but also his childhood, school, and college life, we really do wind up understanding how his head works. It's like we've suddenly acquired an astounding amount of psychological insight and he's sitting in front of us, pouring out his thoughts, allowing us to read him like...an open book. Yeah. Into the Wild is that book. ...If you open it. Though it is laden with much of the same horrific fascination that compels so many of us to "rubberneck" at multi-car-pileups on highways, I can't Into the Wild, really. I mean, it's great. But it's not for everyone--those who have already set their minds that I shouldn't even be recognising McCandless's chosen name in this review: you won't appreciate this book, if what you're seeking is a literary masterpiece. Those with borderline ADHD: you won't appreciate it at all, either. But everyone else...if you've an open mind, why not give it a try? It's something to pick p and flick through, to find some amazing excerpts but not necessarily devour cover to cover. It's absorbing to a point, but less for those who want to introduce themselves to this sort of mindset than for those who already feel some degree of understanding with McCandless/Supertramp. But then, that category could include more people than you'd think. Because, let's face it, as Krakauer proves many times over, who hasn't at some point considered just...striding...into...the...wild? Book arrived quickly, and as described. This story is not for everyone. A very well written book that deals with arrogance, immaturity, and desire to be different. It is pure arrogance to go into the wild so unprepared, without a map, or any knowledge of how to survive. If he hadn't found the bus, he may not have survived as long as he did. It is one thing to be thrown into a situation where you are unprepared, but another to step away from civilization without adequate preparation by choice. This should be a primer for those who wish to get away from it all and how not to go about it. The best Story you will ever read. This is a great story about looking for the ultimate adventure......ALASKA!!! It is a non- stop and touching adventure of Christopher Mccandless(SuperTramp). This is a must read for all ages.... Once I started reading I just could not put it down!! You will love it!